Last week, Morrissey went on record to publicly denounce Warner Music's planned Best Of The Smiths compilation (yes, another one). Now, Morrissey's having another pop at the label, this time over the "slapdash release" of Morrissey Live At The Hollywood Bowl DVD. 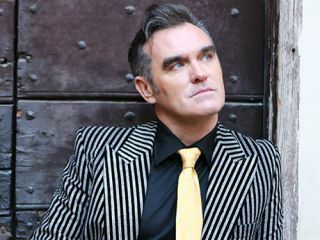 The disgruntled singer moaned: "The slapdash release of Morrissey live at the Hollywood Bowl is done by Warner without any consultation to me whatsoever, and is in breach of their terms as laid out by themselves in an agreement made for the film between Warner and my ex-manager". Being Morrissey, he's concerned with the artwork too: "being Warner, predictably the sleeve art is appalling. It is the work of cash-hounds, and I urge people NOT to buy it. I am not signed to Warner, and no royalties from this DVD will come to me. Please spend your money elsewhere". EMI recently churned out The Best Of Radiohead without consent - just week's after the band invented "doing a Radiohead" with last album In Rainbows. Would Morrissey mind so much if he was getting paid? Yes, it's Morrissey.